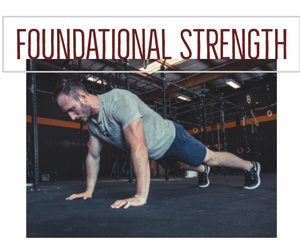 Foundational Strength is right for you if you are coming back to training after time-off, looking for an exercise routine that is not overly demanding of your time, or have limited weight training experience. This program consists of 3 Primary training days per week with an optional 4th day. With limited equipment, these workouts can be done at home. Ultimately, Foundational Strength will help you build muscle and burn fat while increasing your mobility. The single most important factor in sticking with an exercise program is having a support system. We are that support system. Purchasing a guided workout is an investment in your health and a way to hold yourself accountable. It is the perfect way to take the guesswork out of exercise for less than the price of one personal training session.